QUESTION: Mr. Armstrong; I read your One-World-Currency report. It was truly fascinating. From an academic perspective, what came first in the formation of civilization; agriculture or cities? Where does money fit into this historical perspective? ANSWER: There has been a fair amount of assumption that went into the history we were all taught in school. What has emerged since is a different perspective, to say the least! There are megaliths at Göbekli Tepe which were erected by “assumed” hunter-gatherers around 9000 BC or about 3,000 years before history starts to be recorded. Göbekli Tepe is a stone-age mountain sanctuary. It has turned everything upside down insofar as it was assumed that the city came first and then agriculture. It appears that agriculture came first which enabled people to create cities. Göbekli Tepe proves that there was a shift from animism, a belief that attributes a soul to plants, inanimate objects, and natural phenomena inasmuch as there is some supernatural power that organizes and animates the material universe, to centralized religion. In other words, there was a shift from an egalitarian society all people are equal to a hierarchical society arranged in order of rank allowing kings to emerge. Clearly, there had to be a profound economic change and yes there would have to be some sort of monetary reward in the form of some resource to create such a shift from an egalitarian to a hierarchical society. Göbekli Tepe is extremely important despite its obscure purpose and meaning. It is not the meaning that we need argue over. The incredible fact is that such a monument was constructed in the first place back in 9000BC. The simple fact of its very existence proves all historical assumption dead wrong. It matters not whether these pillars that are carved were some religious rite or just a decoration. More than 200 pillars in about 20 circles are currently known and only 5% of the site has been excavated. The astonishing fact is economic. Producing more than 200 pillars took a lot of man-hours. That means the workers needed a stable food supply and therefore agricultural cultivation MUST have been in existence BEFORE cities were carved out of stone. 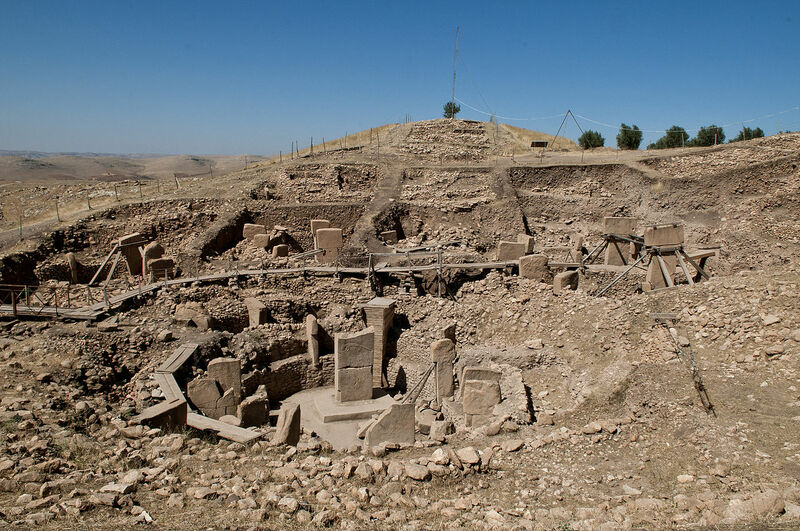 The construction of Göbekli Tepe would also have required some division of labor among overseers, technicians, and workers as well as management. Obviously, this required a hierarchical society. Therefore, social development in creating such structures must have precipitated, rather than resulted from, the shift to agriculture. The assumption was that cities came first and then cultivation was wrong. Obviously, you had to feed the people to construct the cities first. My bet is on cultivation came first and food became money. Money moved from food to clothing. We see the first use of metal as money being Bronze imitating a sheepskin, which was the standard of value; i.e. Jason and the Golden Fleece. Bronze was cast into a shape that was familiar. Clothing had to come after the cultivation of agriculture and then the domestication of animals followed. 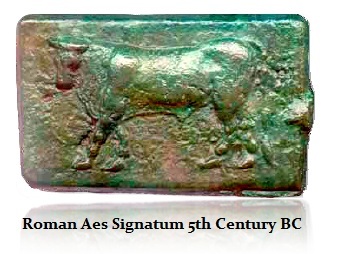 Even the early Roman bronze Aes Signatum (5 pounds of bronze) pictures a bull. Cattle were also a main monetary unit of value prior to metal. You simply had to have the resources to feed the workers to do the job of constructing Göbekli Tepe to begin with. Therefore, cultivation had to come before cities – the chicken or egg problem.